Jobs on campus are useful tools for students looking to earn money and gain real-world experience while they study without having to travel far from school. But for Bianca Gutierrez, winner of the 2016 Student Employee of the Year award, working in the Office of Alumni Relations & Annual Giving for the past year has meant so much more. 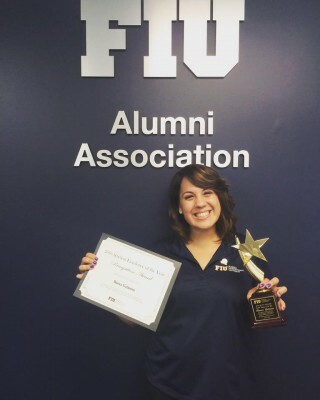 Being a member of the team charged with promoting the Ignite Campaign, FIU’s internal fundraising campaign, has helped her realize her dream of working in the nonprofit sector where she plans to advocate for women’s rights. Gutierrez, a senior majoring in communication arts, works closely with other student employees to support the Annual Giving team at Ignite events, process pledge cards, interact with donors and more. The opportunity has provided her with valuable insight into a potential career in fundraising. Adding to her accomplishments—and her busy schedule—Gutierrez, a member of the Honors College, took the lead in coordinating the college’s Aesthetics and Values art exhibit this year. Development officer Joaklin Raphael, who nominated Gutierrez for the SEOTY award and accepted it in her place when she could not attend the ceremony, said in his submission there is no task she finds daunting. SEOTY is part of a national student employee recognition program introduced to FIU by Jaffus Hardrick, vice president for the Division of Human Resources, when he came to the university eight years ago. The Great Gatsby-themed event featured a brunch reception and a photo booth, followed by “The Power of the Look,” a spring fashion show by Ann Taylor demonstrating the dos and don’ts of work attire for young professionals. Working on campus offers students the “opportunity to go beyond the classroom and focus on the early stages of professional development,” Travis Stokes, a Parking and Transporting coordinator, said during the ceremony’s opening remarks. The SEOTY awards ceremony, which took place April 15 in the GC ballrooms, is the culmination a weeklong celebration of FIU’s student employees, who make up about one-third of the university’s workforce. SEOTY week’s events include a social media contest, an office decoration contest and more.